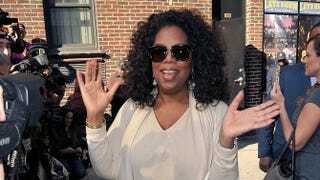 On Monday we reported that Oprah Winfrey purchased a 10 percent stake in Weight Watchers for $48 million. The acquisition came with a five-year endorsement agreement that would make Winfrey the face of the brand for some of its promotional efforts. Well, because of Winfrey's power, reach and brand appeal, her 10 percent equity stake is now worth approximately $110 million, Forbes reports. Yep, more than double her initial investment. Oh, and there's more: The Weight Watchers stock ballooned, too. Forbes is reporting that Winfrey's deal generated $700 million in "stock market value" for the company. The company's shares are up 170 percent since Monday morning. In a statement, Ray Debbane, the chairman of Weight Watchers, called Winfrey a "force of nature." She sure is.